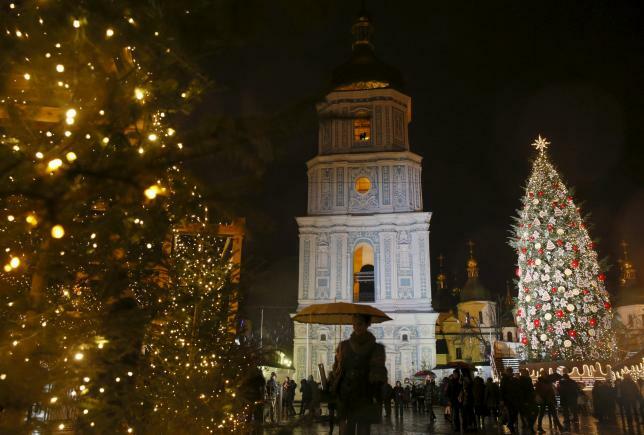 KIEV, Ukraine -- Ukraine, which marks Christmas on Jan. 7 according to Orthodox Christian tradition, has embarked upon a national debate about whether it should also celebrate on Dec. 25, a step that would bring it in line with Western Europe. People walk past Christmas trees near the Bell tower of the Cathedral of St. Sophia in central Kiev, Ukraine, December 22, 2015. The debate - which reflects a re-examination of national identity under the impact of the falling-out with Russia - could sharply divide opinion and comes amid a heightened battle for influence between the Russian and Ukrainian branches of the Orthodox Church. After Russia annexed Ukraine's Crimea last year and pro-Kremlin separatists launched a rebellion in the east of the country, some Ukrainians began to re-examine their historically close cultural ties to Russia. Activists in favour of making Dec. 25 - currently an ordinary working day in Ukraine - an official holiday have started two petitions which have appeared on the presidential web site. If they garner enough support President Petro Poroshenko will have to consider the matter, though the Ukrainian parliament would have the final word. Oleksander Turchynov, the secretary of Ukraine's security council, has backed the idea, saying he favours a transition period during which Ukrainians could celebrate Christmas on Dec. 25 as well as on Jan. 7. The Russian Orthodox Church dominates Ukraine's central, eastern and southern regions, while Catholics and Greek Catholics are concentrated in the west of the country. "We, Christians of different confessions of Ukraine, without abandoning their own traditions and wanting to celebrate Christmas with the whole Christian world, ask for a holiday to be established in Ukraine on Dec. 25 in honour of Christmas," one of the petitioners said.